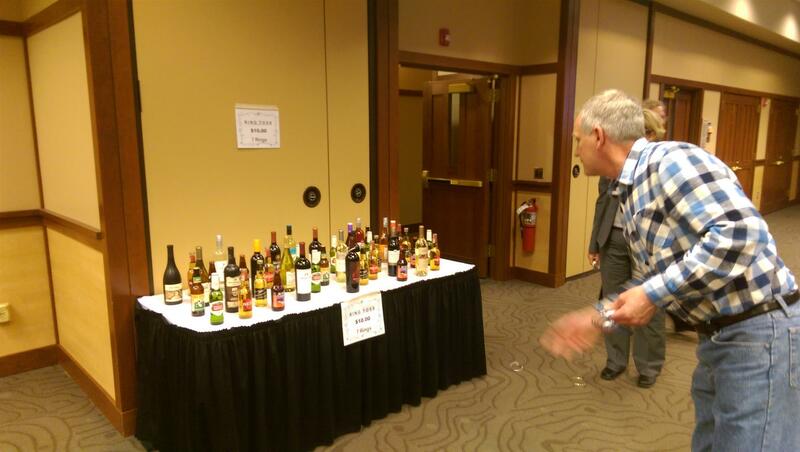 HARC Service Auction a Success! 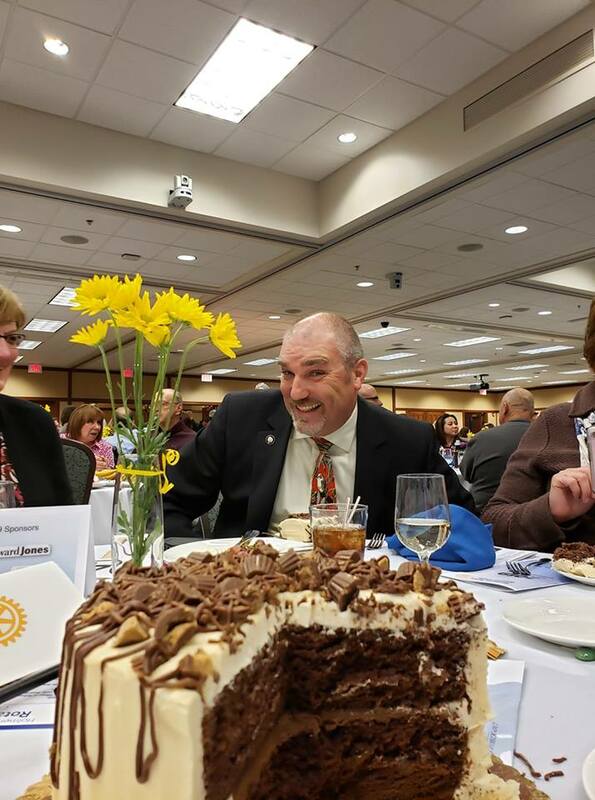 The Holmen Area Rotary Club's April 4th Thursday Night Service Auction was unforgettable! Dynamic MC Dustin Luecke and fast talking Auctioneer Alex Goodman kept every one on the edge of their chairs and the laughs coming as they peddled the unique services the club was offering. 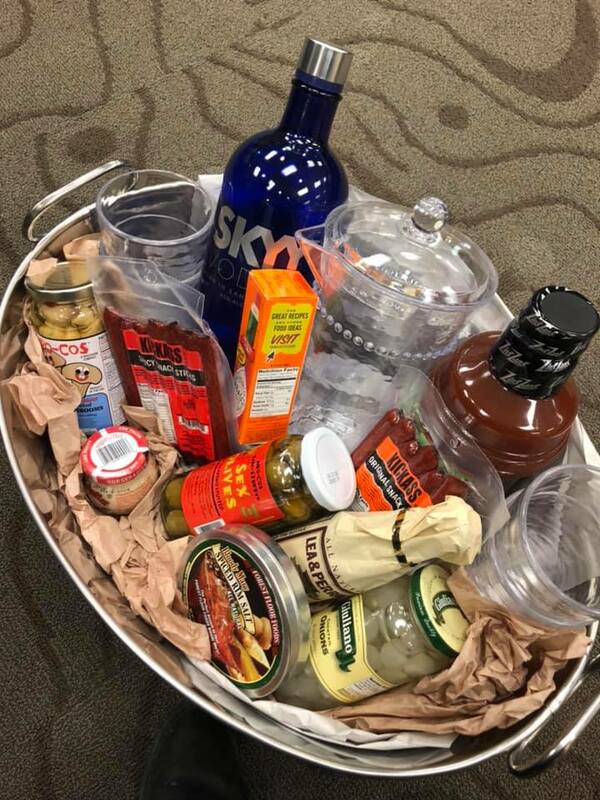 For the live auction, members offered everything from a summer of lawn mowing, sailboat excursions, plane rides, meals on wheels, custom jewelry, custom smoked meats, paddlewheel party packages, internet marketing service, signed football helmet, car cleaning, Limo Service to a whiskey and cigar extravaganza. The Gourmet Cakes did not disappoint this year and were deeelicious! There were plenty of activities besides the live auction to keep folks occupied. 20 bucks bought you 20 chances to win one of the many interesting and valuable baskets. Or for just 20 bucks you could have won over $1300 in Holmen Business gift certificates. For a measly $10 bucks you had 7 chances to throw a ring over a bottle of Dom or MGD, depending on your skill (or luck). And for $5 you could get into a 50/50 raffle to win a quick $130. The food was fantastic and plentiful and the drinks cold and tasty. The live auction ended by selling handmade friendship bracelets created by Justin Bodin. All proceeds from the bracelet sale will go to Casa Hogar Orphanage in Peru. 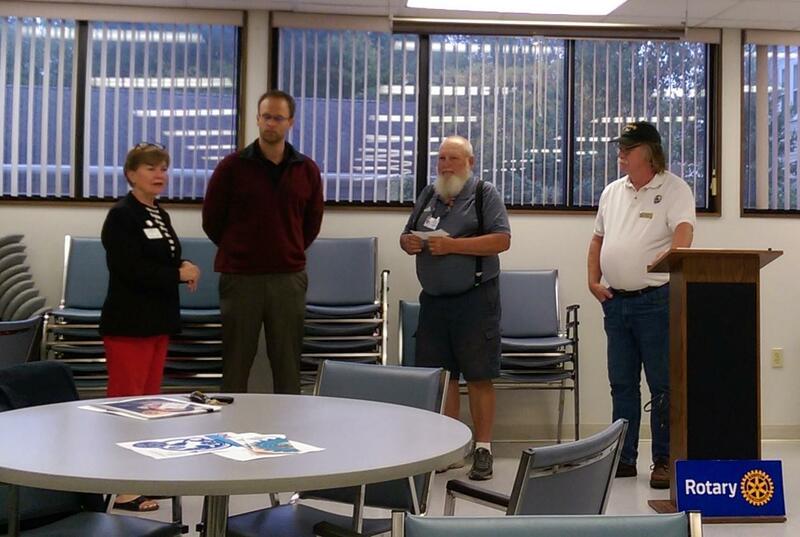 Thank you to all that came out and supported the Holmen Area Rotary Club! We hope to see you next year! If you could not make it this year you missed a very fun event. We hope to see you too! 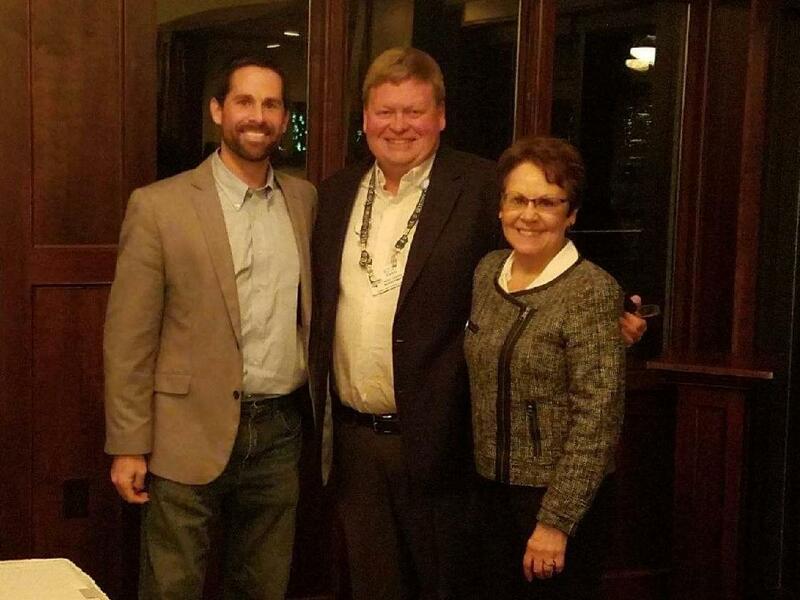 Saturday night, February 9th, Holmen Area Rotary Club members got together at Drugan's Castle Mound to break bread and reflect on the past years achievements and listen to future plans for the club. Barry Ploessl stood before the crowd and listed the year's many efforts and also put out a challenge to provide significant support for the proposed Holmen Community Center. 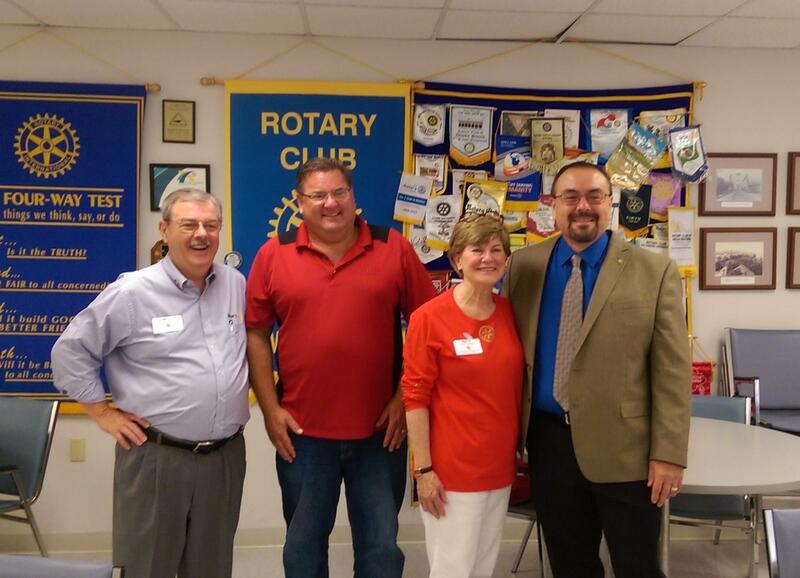 Scott Marshall was voted as the Rotarian of the Year. Scott has been active with the Holmen Community Garden and also providing a good story and a welcome laugh at the weekly club gatherings. Congratulations Scott! Incoming President Art Lyons spoke about his plans to continue the successful programs but to also look at new opportunities for the club. 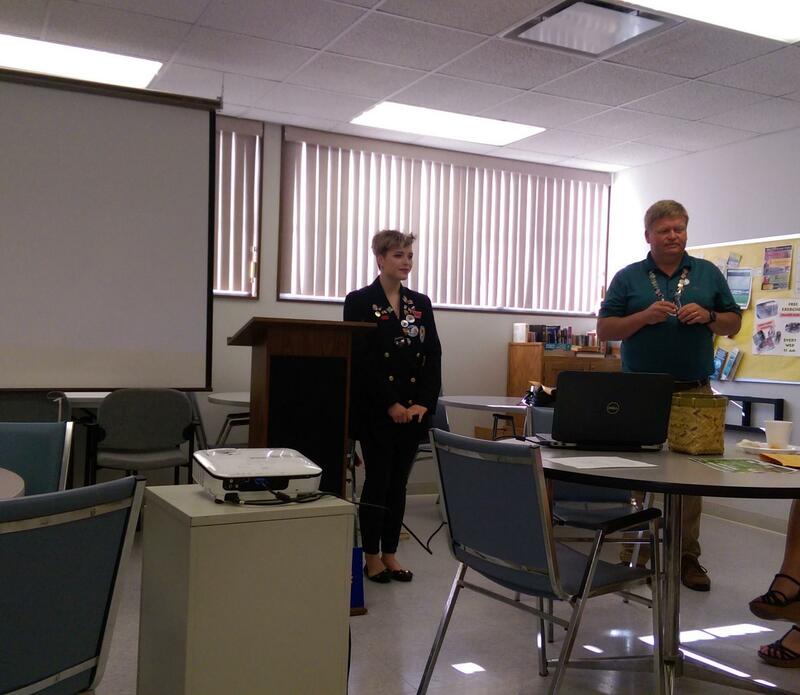 Wednesday's HARC meeting was a treat with Sami Helgeson stopping by to update the club on her activities since being a Rotary Exchange student. 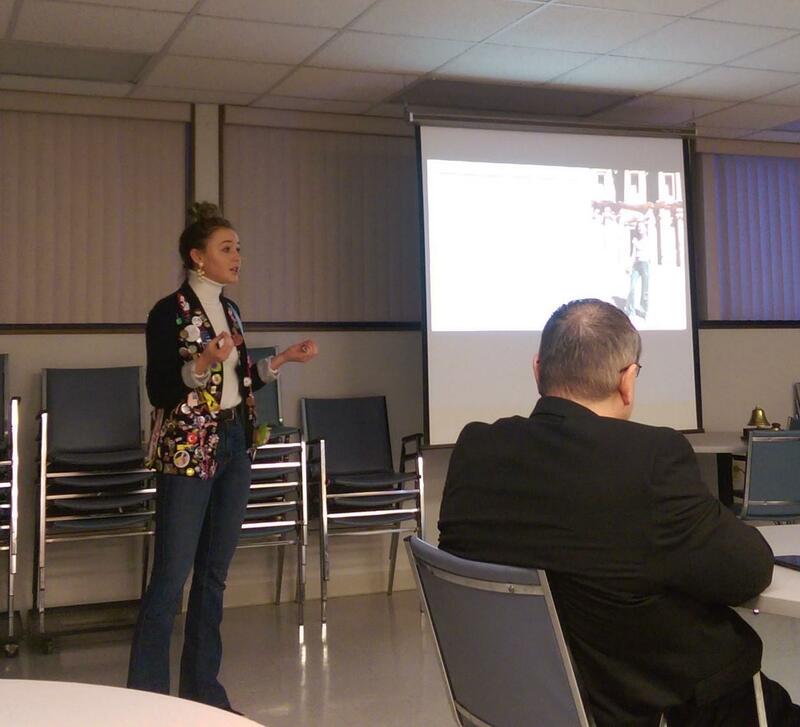 Sami was drawn to the Holmen High School Rotary Interact Club with their "Service Above Self" message. She was accepted as the 2014-2015 outgoing Holmen Area Foreign Exchange Student and spent almost a year living with a host family and attending school in Indonesia. Sami is now attending University of Denver, working towards a double major in Environmental Science and International Studies. Sami has been very active, volunteering for PlatteForum, Charles Hay World School PTSA and DU Public Achievement, an internship at the EPA, participating in the Pioneer Leadership Program - University of Denver and involved with food resource programs Plates for the Planet and Food Recovery at DU. As part of her studies, Sami has participated in the University's Study Abroad program, learning Arabic and spending the last semester living in Amman Jordan in the Middle East. There she was embedded into the community, living with a host family and experiencing the culture. She witnessed first hand the effects of over a million Syrian refugees and the humanitarian issues that ensue. As part of the experience, Sami traveled to the United Nations European Offices in Switzerland and met with representatives of front line NGOs like Doctors Without Borders. 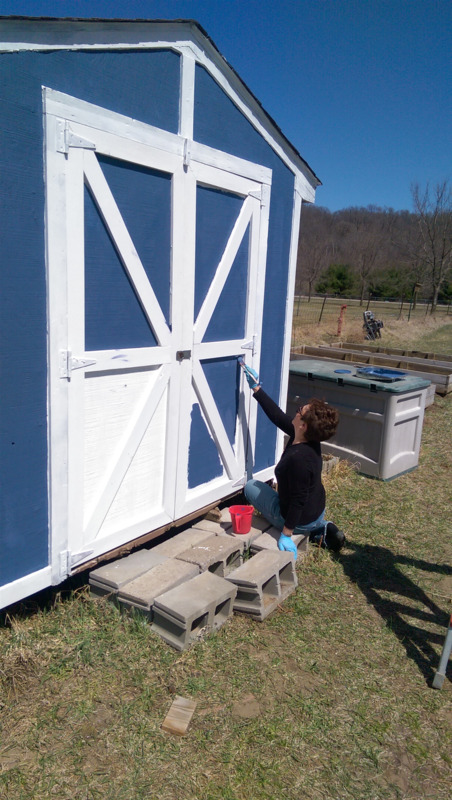 She was able to use her environmental sciences knowledge through an internship at Queen Rania Family and Child Center, working on an agricultural curriculum for their educational greenhouse. Sami's future goals are to graduate in 2020 and then apply to the Peace Corps. Sami attributes her global mindset to the opportunities offered by Rotary. Rotary International states "Rotary’s programs are developing the next generation of leaders, providing funding to make the world a better place, and making peace a priority." I think they succeeded here. iFeed November 3rd 2018 - Team HARC helped fill 101,088 meals that are on their way to Nicaragua to feed hungry children. Over 35,000 food items were collected to fill the shelves at local food pantries thriough the Hunger Task Force. Way to go Team HARC! 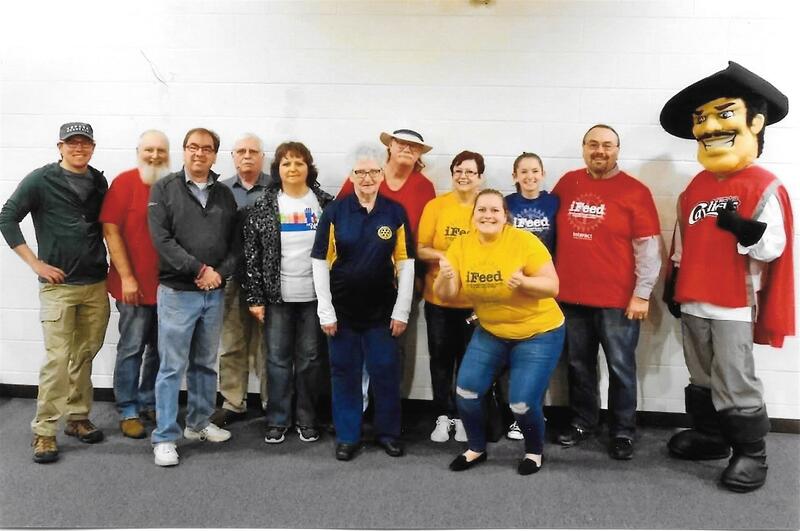 The Holmen Area Rotary Club recently donated Festival Foods Gift cards so that 10 families in New Horizons Shelter and Outreach Centers' program could have a Thanksgiving meal. If you are not familiar with New Horizon's , check them out at http://www.nhagainstabuse.org/. They are on the front line in the fight against domestic and sexual abuse in the La Crosse area. New Horizons provides shelter and services to a seven county (population 238,236) area in Wisconsin and Minnesota. The Shelter is staffed 24 hours a day, 7 days a week, 365 days a year to provide emergency shelter and food to victims of domestic violence and their children. Along with the physical needs, New Horizon's also provides ongoing counseling and advocacy programs. In 2017 they fielded over 2500 calls to their crisis line, provided over 260 men women and children with more than 10,000 nights of safe shelter and provided free and confidential services to over 1500 victims. New Horizon's receives some grants but relies heavily on donated funds to do their work. If you aren't a donor today, think about adding this worthwhile cause to your list. Many hands make quick work. 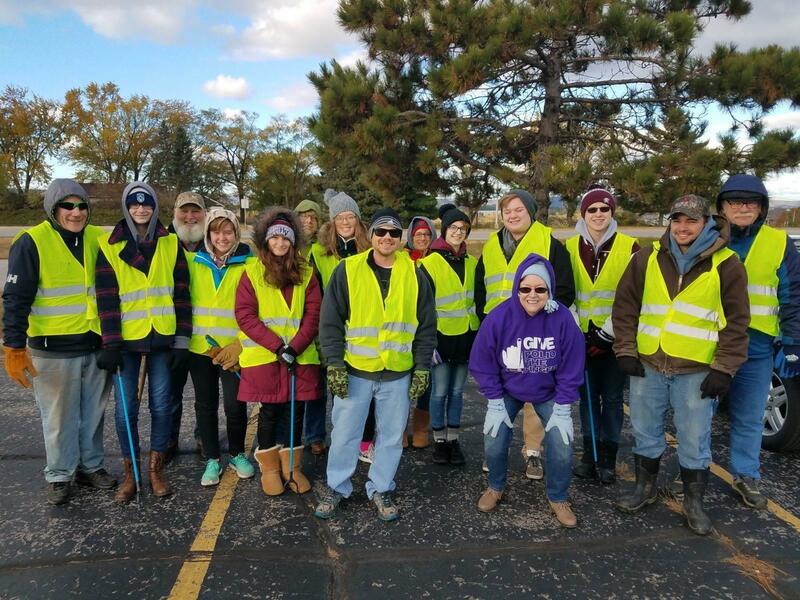 This fall's Holmen Area Rotary Club's Highway cleanup was done in record time due to the number of enthusiastic volunteers that showed up. The day was windy and cold with a freaky sleet/snow storm in the middle of it but there was nary a complaint. The Holmen High School Interact club turned up in force, showing the old folks how to do it. They even had a dance contest going on roadside to some Christmas classics. Thank you to all that showed up on a challenging day and picking it all up! Holmen is a much prettier place for it. The Holmen Area Rotary Club was honored to receive a grant from Rotary District 6250 to help with the efforts on the Holmen Community Garden. 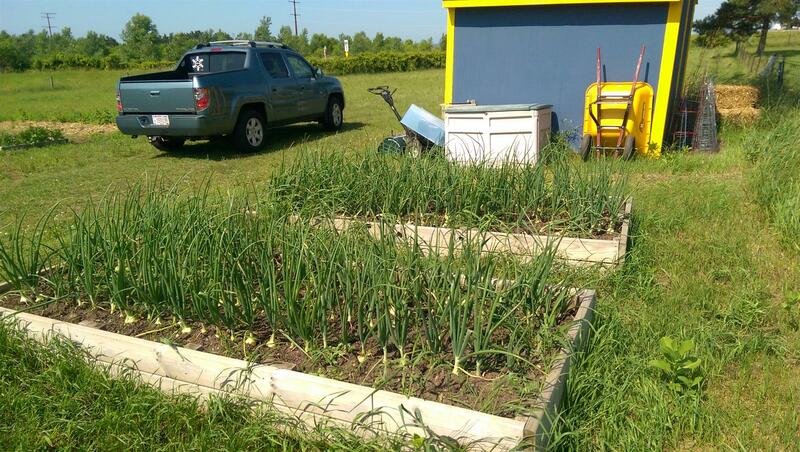 The Garden was started last year and 2800 lbs of produce donated to the community. 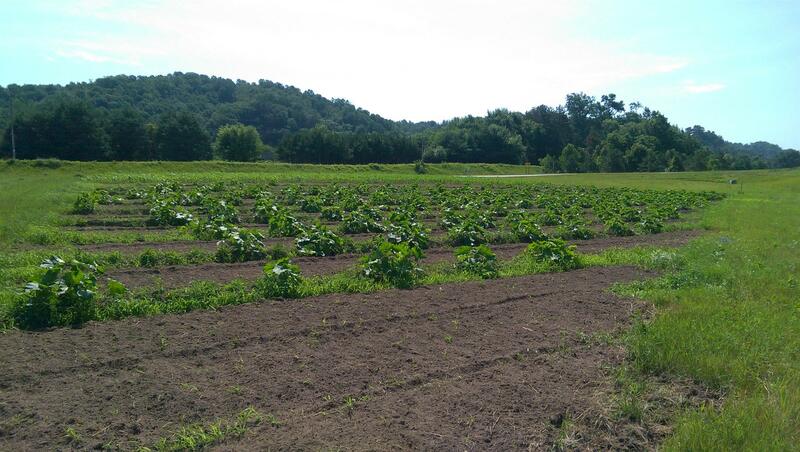 This year the amount of ground tilled was doubled and it is estimated that almost 7000 lbs of food will be harvested. The veggies went to St Elizabeth's Food Pantry, Hunger Task Force, WAFER, Prairie Home, McHugh Manor, Ponderosa, Senior Meals at the Village Hall, Holmen's Hope Community Dinner and other avenues. Josh Mansee, District 6250 Grants Sub Committee Chair and District 6250 Assistant Governor Patt Boge presented Tom Knobloch and Scott Marshall with a check for $2950 which will be used to buy gardening equipment. Hoes, shovels, wagons, rototiller, mower and additional storage space. On the morning of August 15th, the Holmen Area Rotary Club slept in instead of going to their regular am meeting at the Village Hall. In its place, they all met at the Holmen Community Garden Wednesday evening. 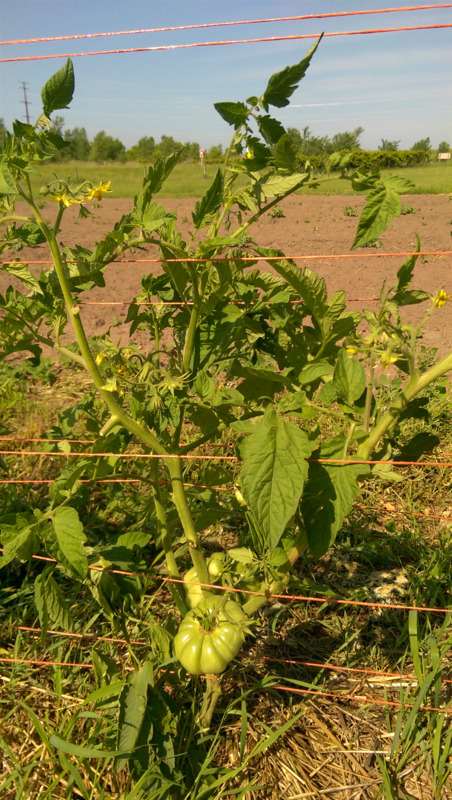 Now what do you get when you put the Holmen Rotary and the Holmen Community Garden together? A mountain of sweet corn of course! 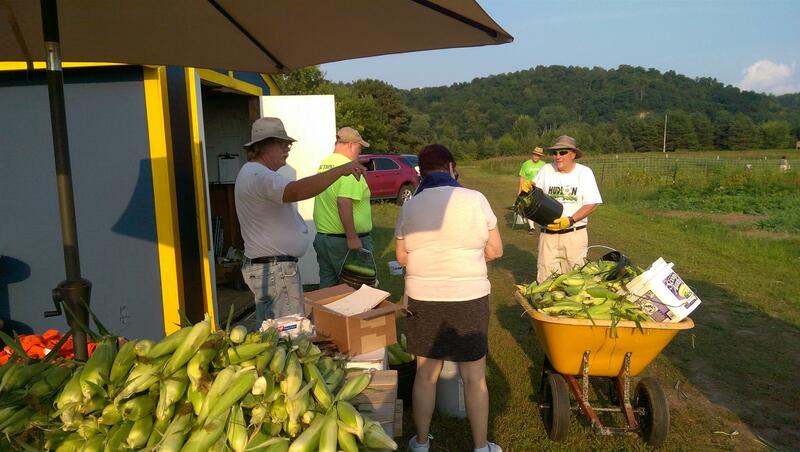 The members picked buckets of cucumbers, boxes of tomatoes, zounds of zukes and wheelbarrows of sweet corn. Some of this fresh bounty was grilled and consumed before it could be carted away, washed down with a soda or barley pop. As you read this, these veggies are working their way into the community, available at designated sites and local food pantries. 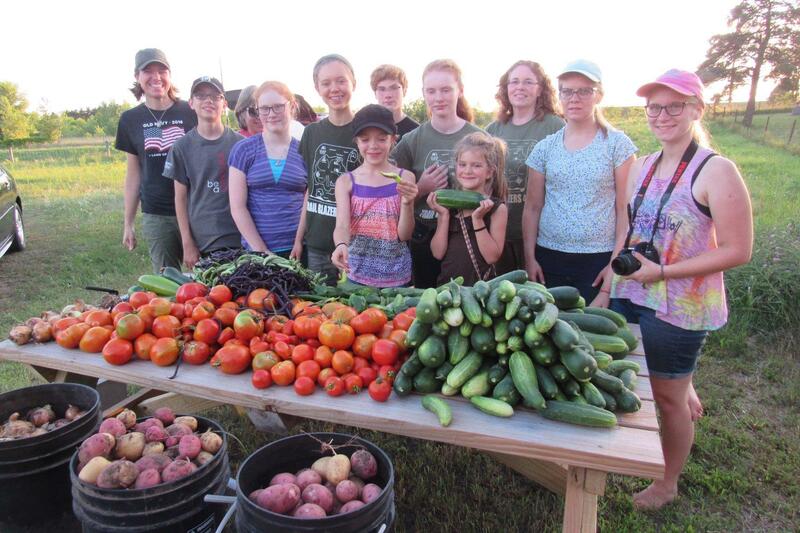 Approximately 1500 pounds of produce was picked and distributed. Thanks a ton for the help tonight from the Trail Blazers 4H Club at the Holmen Community Garden. We collected over 200 pounds of veggies for our community. We truly appreciate any help we can get. And the best part ......FREE VEGGIES. 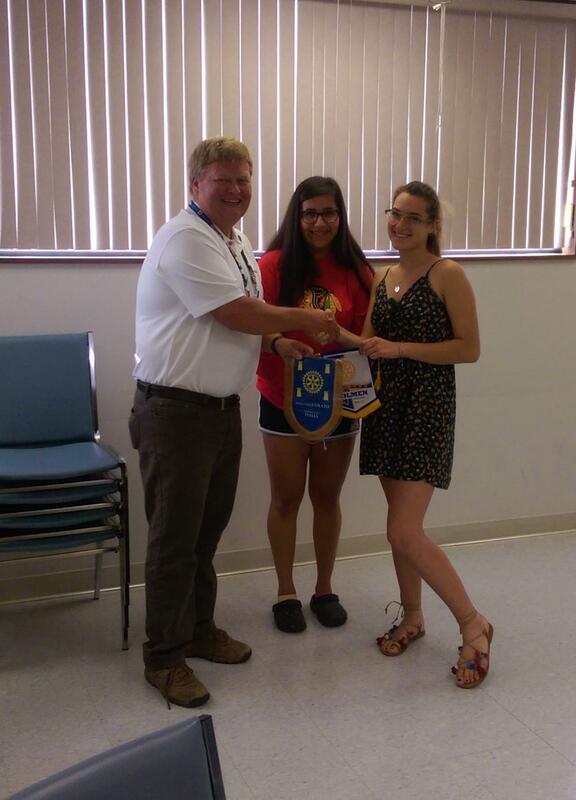 At Wednesday's July 18th HARC meeting, two short term Foreign Exchange students were welcomed and Rotary flags exchanged. Sasha Cromheeke was hosting Camilla Quimto from Italy and Lizzie Pfaff was hosting Silvia Scavello, also from Italy. The short term program allows one of the students to spend 3 weeks in the host country and then the host student travels back to the exchange students home for 3 weeks in their country. Ms. Quimto comes from the Rotary Club Corato in Corato Italy and Ms. Scavello from Rotary Club Varedo E Del Seveso in Milan, Italy. As HARC Student Liaison Scott Ryan explained, "These connections provide insight to other cultures and creates understanding between people from faraway places, promoting peace." Welcome to Holmen ! Tommy, Tommy, how does your garden grow? Too fast! Monday, Friday and Saturday mornings 8-11am and Tuesday, Thursday Nights from 5-8pm. 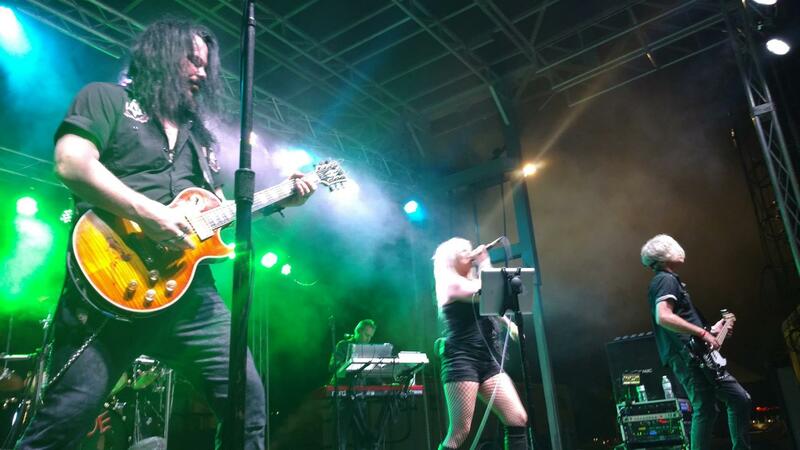 Holy Cow did we have fun Rotary Rock N Ribs! From the BBQ to the BASS, Bands and Great Friends! We had some amazing partners and many Team Members all work so hard for this! 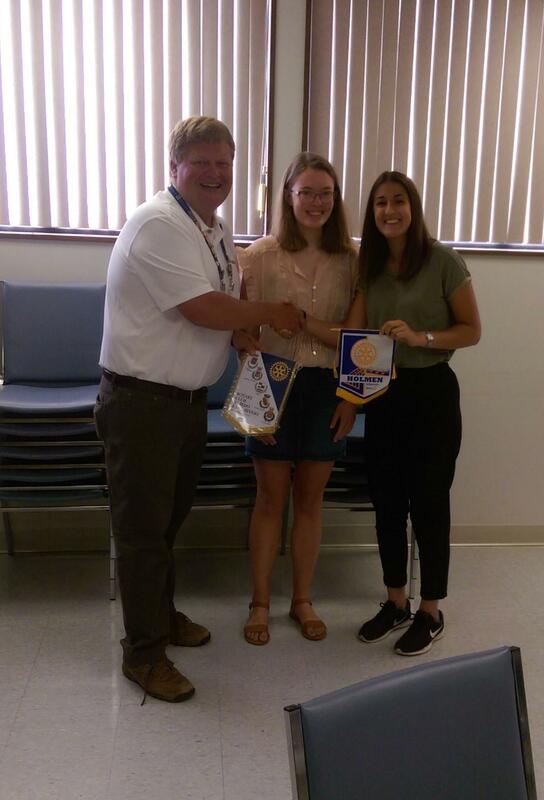 On Wednesday June 27th, the Holmen Area Rotary Club were privy to Holmen High School Student Anja Houghtaling's draft of her origin's presentation. No, you are not having de ja vue. Anja is Zoe Houghtaling's sister. Anja will be traveling to Thailand to live with a host family for a year and Zoe heads to Brazil. Anja's stay will be in the mountainous Chiang Mai province in the northwest corner of the country. Both leave in August. Mom Tracy said this about her sudden empty nest " First, I will have a major breakdown, then try and find out who I am again." Anja's presentation includes information about herself, her family, activities and interests along with interesting local information. These presentations can be given in the host country to the local rotary club, school etc. when the student arrives. Anja has been boning up on the Thai language and customs so that she can converse with the locals. We wish Anja a safe and wonderful adventure! 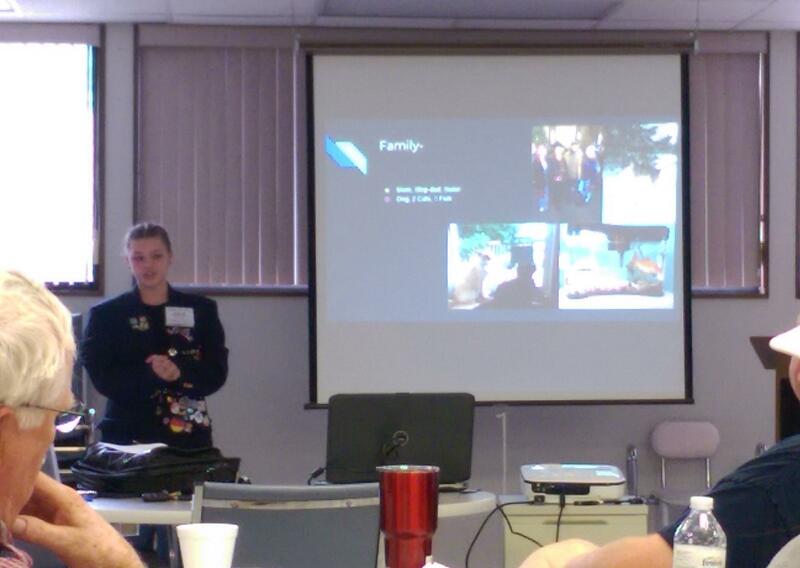 On Wednesday June 13th, Holmen High School Student Zoe Houghtaling (pronounced Hoteling) presented to Holmen Area Rotary Club a draft of her origins presentation. Zoe is being sponsored by HARC as an outbound foreign exchange student later this summer. Ms. Houghtaling will be traveling to Brazil to stay with a host family for close to a year. The origins presentation is what the student uses to show her host and new friends what her hometown and state are like, along with a description and pictures of her family, school and activities. The Holmen Area Rotary Club has sponsored more than 30 young people both inbound and outbound as foreign exchange students in the 10 short years of being a Rotary Club. These opportunities to experience other cultures first hand promotes a greater understanding of other cultures, build strong multinational friendships and advance world peace. We wish Zoe safe travels and know that she and her sister Anja represents the best of Holmen. 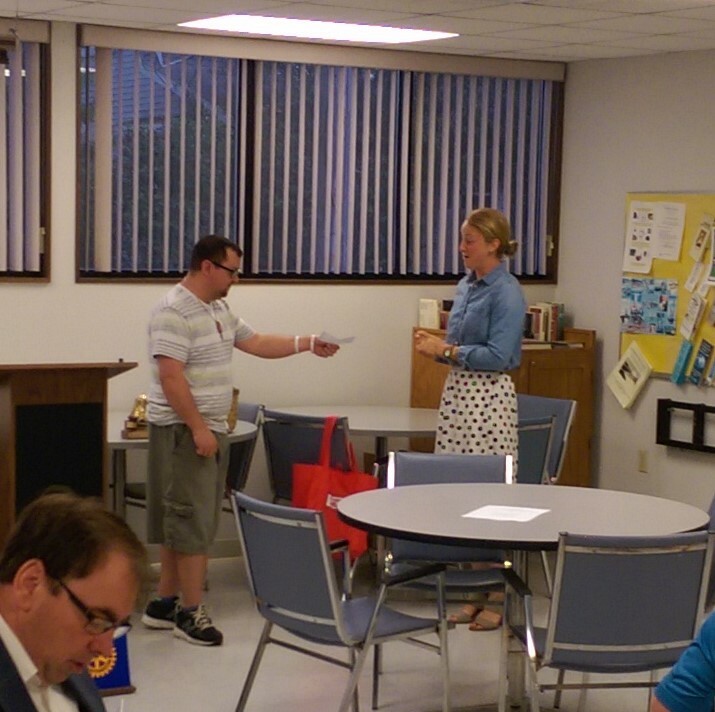 On Wednesday, June 6th, Holmen Area Rotary Club's Justin Bodine was able to present a check to Sarah Sceery, Director of Development for Casa Hogar Juan Puablo II Orphanage. Justin was able to raise a phenomenal $2840 by hand making 10 friendship bracelets and offering them up at the recent HARC Service Auction. Ms Sceery was also able to update the HARC members on the Casa Hogar Mission. The Casa Hogar orphanage in Lima Peru provides a family environment for 65 at risk children between the ages of 4 and 17. The Orphanage organizes the children into family units of 8 children, 4 groups of boys and 4 groups of girls. This structure helps the children develop interpersonal and social skills, lasting relationships and support structure. A recent addition is a program called 'Project of Life' that continues support of these children after they turn 17. This program helps the adolescent to create a life plan whether to further education or work toward employment. Casa Hogar was started as a mission of the Lacrosse Diocese so has a local La Crosse connection. 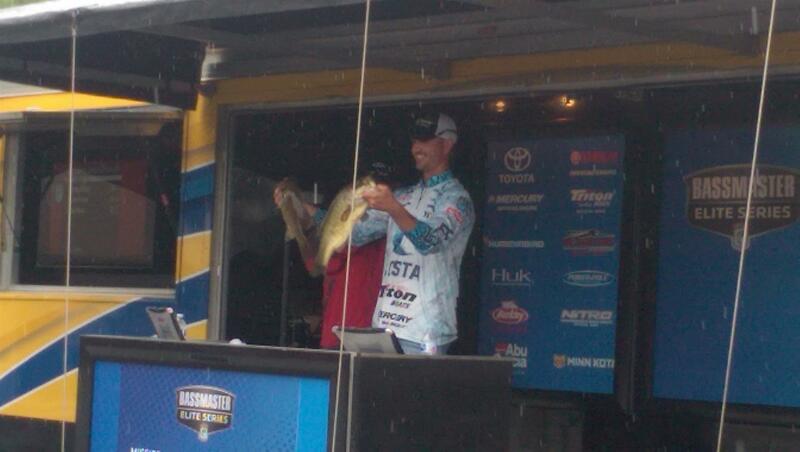 Way to go Justin! And thanks to Casa Hogar for giving these children a chance! 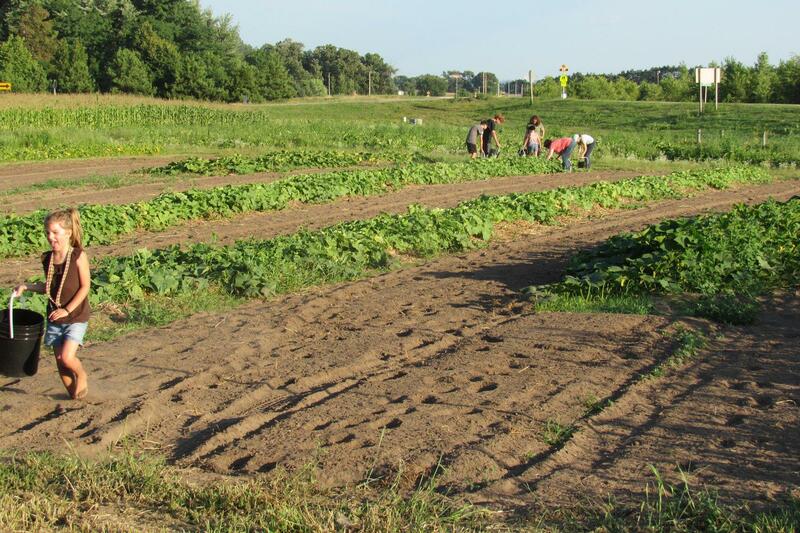 The Holmen Community Garden lost it's stealth status over the weekend. 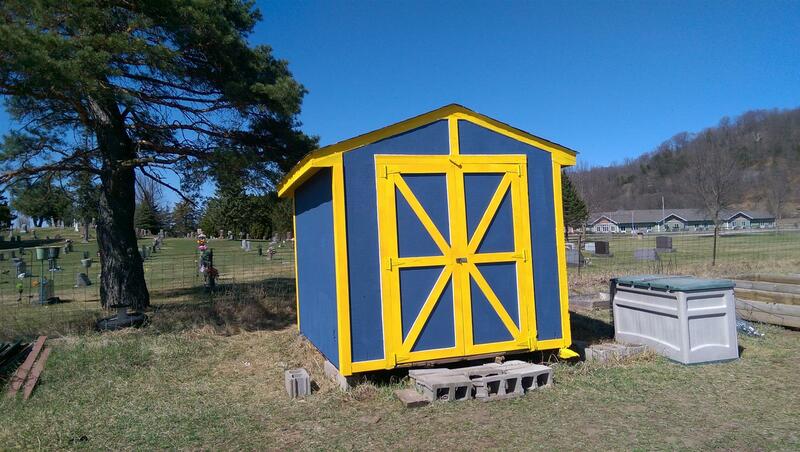 The shed got painted in Lion's and Rotary Colors and is a real eye catcher. The raised beds were set and planning done to get the ground fertilized and turned by the end of next weekend. We'll be planting soon! Thanks to all that participated! Art Lyons spoke this morning about past international projects and current efforts being done on behalf of the Holmen Area Rotary Club. Providing clean water is one of the 6 main missions of Rotary. According to Rotary International, "Clean water, sanitation, and hygiene education are basic necessities for a healthy environment and a productive life. When people have access to clean water and sanitation, waterborne diseases decrease, children stay healthier and attend school more regularly, and mothers can spend less time carrying water and more time helping their families." 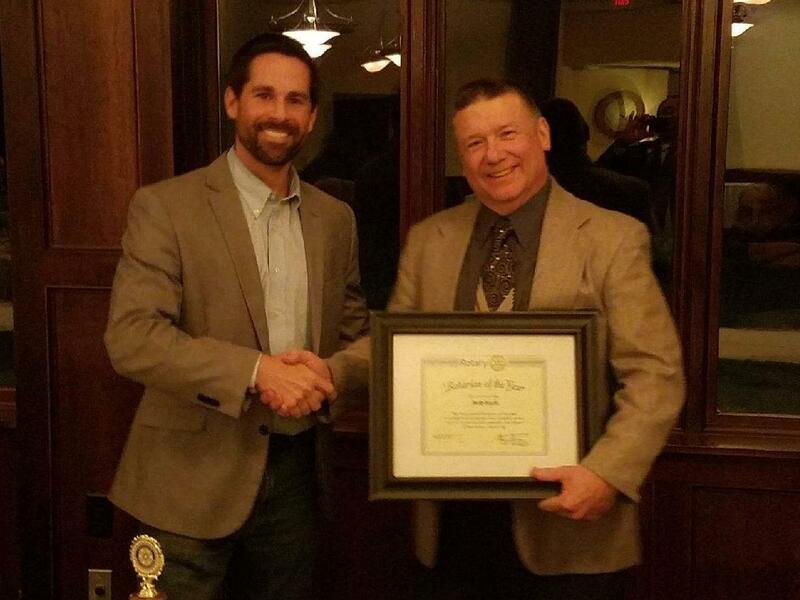 In 2017, the Holmen Area Rotary Club partnered with the Lakewood Ranch Rotary Club to assist with their $50K Peruvian water project in the community of Ivan Vasquez. The project includes a central, solar powered treatment facility and Rotary's WASH hygiene education program. The facility becomes a public utility for sustainability in the community. The project for 2018 is to continue to partner with the Lakewood Ranch Rotary Club and establish a similar solar powered treatment facility for the Peruvian community of Monte Castillo. Monte Castillo is a larger community of 12,000 people with a school and clinic. This project carries a $80K price tag but is again possible through the ability to take initial donations and increase them through available Rotary grants. To learn more about Rotary's water projects go to https://www.rotary.org/en/our-causes/providing-clean-water . 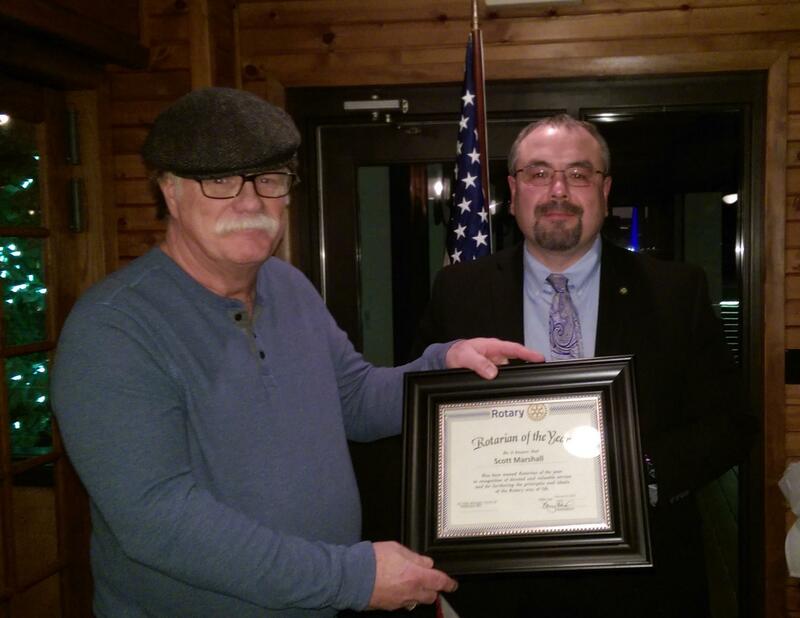 On February 24th, the Holmen Area Rotary Club came together at Drugan's for their annual dinner meeting. After a fantastic buffet dinner, the club took time to reflect on the past year and give thanks to those that helped make it a success. Jason Munz gave the Presidents address as his last official act of his too short presidency. Jason has taken a new job in Eau Claire and we will miss him. The past years projects and activities are numerous; The Community Garden, Holmen's Hope dinner and packing backpacks, Thanksgiving dinners for New Horizon Shelter, Deerwood Park Shelter commemoration, IFEED, Highway clean-up, High School Student of the month Scholarships, STRIVE Mentors, Foreign Exchange Student, Rotary Lights, Interact Club, Rockin Ribs, Habitat for Humanity, supporting polio eradication and many more. Scott Ryan stepped up and introduced the two Host families that made foreign exchange student Pranav's stay possible. The Wendie and Mark Schmitt family hosted Pranav for the first school semester and Lisa and Terry Kind family hosted Pranav for the second semester. Scott quoted Mark Twain when explaining the importance of this cultural exchange who stated “Travel is fatal to prejudice, bigotry, and narrow-mindedness, and many of our people need it sorely on these accounts. Broad, wholesome, charitable views of men and things cannot be acquired by vegetating in one little corner of the earth all one's lifetime.” So true. Judy McHugh and Scott Ryan both received Paul Harris Fellowship Awards. The Paul Harris Fellowship rewards those that contribute significant support to The Rotary Foundation of Rotary International. Barry Ploessl stepped up as incoming President and gave a speech outlining things to come and looking forward on new ideas to keep the club fresh. No Office - Office Party was a blast! 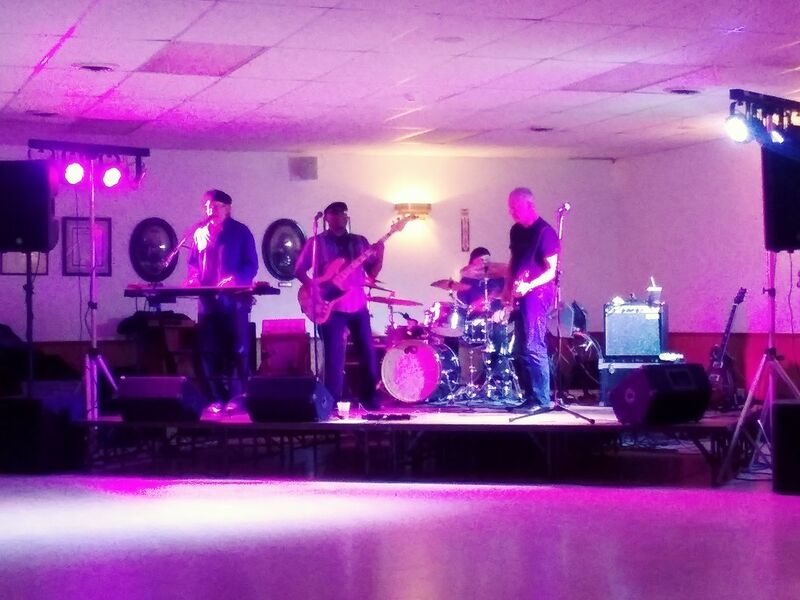 On Friday night , February 9th, the Holmen Area Rotary Club sponsored a wild party at the Legion. 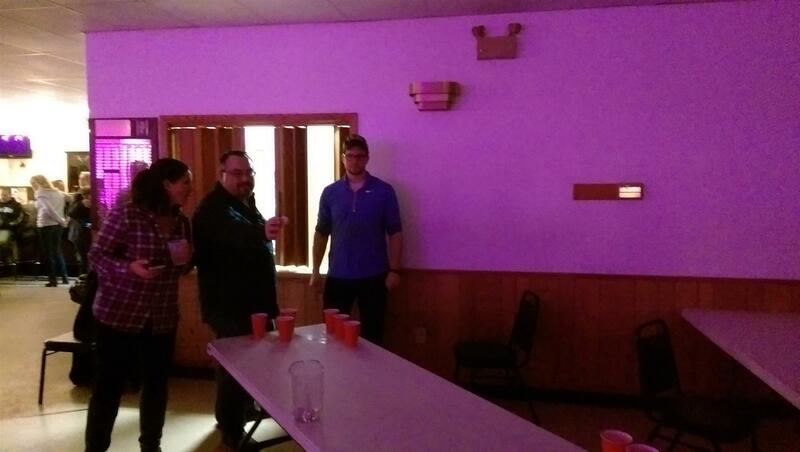 The participants ate at the Taco Bar, consumed various drinks, shook their bootees dancing, played games of questionable skill and listened to fabulous music from the Shufflin' Duprees. 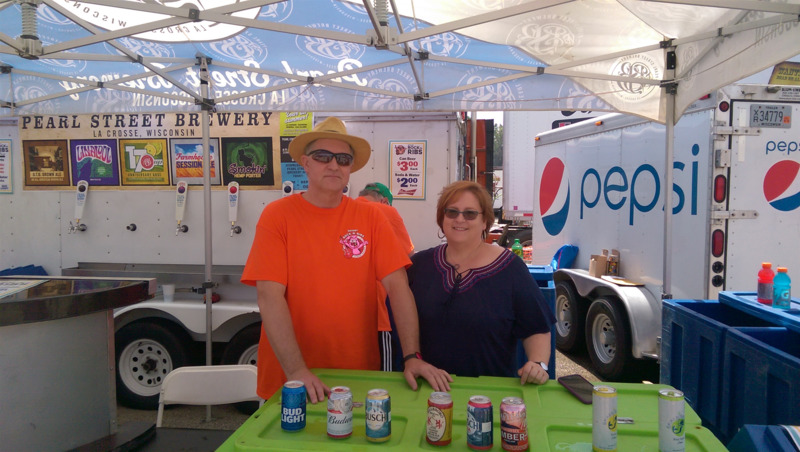 The focus of the event was to have fun but to also entice new folks to become interested in Rotary. It was a blast for all who came and surely a sad day if you missed it!